Factual error: During the FIRST battle with an Anaconda, the 55-gallon fuel drums lashed to the deck of the riverboat are swept over the side, where they sink to the bottom of the river. This plot device drives the rest of the movie, since the boat must make a dangerous detour through "Anaconda country." There is just one small problem with this: Fuel drums full of diesel fuel OR gasoline FLOAT on water! The fuel in them makes them buoyant. It would have been a simple matter for someone to get a rope or a boathook and retrieve the fuel drums before they floated away. 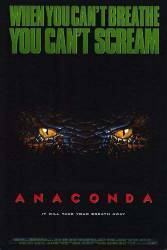 Factual error: All throughout the movie, the snake makes a screaming sound. Snakes don't make sounds like that. Denise Kalberg: How dare you! It was you, who brought that snake? You brought the devil. Paul Serone: There's a devil inside everyone. Danny: Hurry up! I think I can blow him up.